UPDATED: Below, I've written some ideas for mutators, options or similar additions that may be extra helpful when used in tandem or with vehicles and on larger open areas with pincer attacks. The source of the Threat Detector idea come from my days of using an old aircraft fighter sim called Jane's USAF. In that and in real fighters is a device called Radar Warning Receiver (RWR) which, aside from how it works, warns the pilot that dangerous things are on their way. I've been formulating something like the Tactile Sense Indicatior throughout playing several different FPS games over the years. 1) The Dial - A clock-like *multi-function capable* in-game GUI element which could be an option and/or automatically enabled if subsystems are enabled either as mutators or options in settings. In 3D space, it would be on the floor of a perspective rectangular prism that shares a face with the player's screen (see photos). By default, it probably should be horizontally centered on screen and vertically somewhere south of the cross hairs. This would show polar/directional information provided by other systems. This could also possibly surround the cross-hair as a circle but I find that a perspective view is easier to glance at and understand it's info since it relates to lateral direction information. 2) Tactile Sense Indicator - This could draw on The Dial's circumference fuzzy grey arcs and higher drawn opacity could mean higher pressure/resistance when up against physical obstructions. This could be useful at any time for any obstruction that is not seen yet. In programming, an approach to making this work could be to have in the client software collision "sensor" objects, maybe smaller versions of the player collision box, that are not solid to others but are affected by the environment. These invisible objects could be initially positioned in a polygonal (maybe a hexagon or octagon) pattern around the player, be "stuck" to a limiting line between polygon's vertex to the center of the player and have a virtual elastic band that pulls the box taught to the vertex. When this collision sensor object is moved away from the vertex (and thus towards the player) by an obstruction, the Tactile Sensor GUI portion would draw an increasingly opaque fuzzy grey arc for that area of the sensor. 3) Threat Detector - Gives warning by way of pulsating-color clock-hand-like arrows to *incoming only* projectiles within a certain angle between projectile's trajectory vector and a line from projectile to the player's position. Physical projectiles like rockets, grenades, plasma globs and other physical projectiles would be applicable for detection while bullets, nex shots and other fast traveling projectiles would not show. If the player was staring at the dial while, say, a rocket was shot at them and missed by a bit then the arrow would be mostly stationary and opaque but begin moving to follow and becoming transparent exponentially until it fades long before the player is 90 deg from the projectile's trajectory. The maximum angle between projectile trajectory to player could be a cvar and might work best near 30 degrees. As a projectile's trajectory varies from "will be a direct hit" (laterally, if Threat Detector is limited to 2D display on dial) at 0 deg to that maximum angle (maybe 30 deg) the arrow would be rendered from opaque to totally transparent. Further than that, an arrow might not be drawn at all depending on graphics impact and software capability. Program the client software to, when Threat Detector is enabled, compile a dynamic list of player damaging game projectiles (even one's own maybe if it were ever possible to have a missile or something come back at you [Submarine's 1st mate to Captain "You've killed *us*!"]) with each's type, speed, direction, instantaneous acceleration/deceleration and position (or bearing to projectile from player). This list would be continuously calculated, with trigonometry, against the player's position, the maximum angle value I described earlier and the arrows would be rendered according to projectile direction, transparency and so on. 4) Player Impact Physics - Have you ever, while in air, impacted another player and noticed how both players just stop instead of bouncing or something akin to tumbling? The idea here is to somehow improve impact physics by introducing mid-air billiards-like physics so that players either bounce/deflect off each other and/or tumble (not visually, necessarily) over/under each other, if one is higher than the other and depending on speed, in combination with both players being forced to do a mid-air crouch to clear each other. Can't see an attached picture. The dial gui idea is not bad, but I don't think it would work in 1st person view very well. For a 3rd person game yes, but Xonotic isn't one. And that's is why they are out of place in a FPS. More like "5 old aircraft fighter sim ideas". Aircrafts don't have eyes and brains, this is why they need all that electronics, all them radars. Xonotic is a first-person game, the player is the model, he has all his senses to use in orientation, there is no hull around him, nothing hinders his mobility and speed, nothing obstructs his FOV, he can easily look behind him and avoid projectiles. All these systems are not needed for "infantry" in Xonotic, but a radar, an "incoming missile" indicator and flares can work with vehicles. They worked well in Enemy Teritory: Quake Wars. Not needed for Xonotic, both the projectile speed and player speed and mobility are high. Besides, this a very CoD-like feature, people will think we went full casual and soon will add iron sights and sprinting . Ridiculously useless. Really, hard surface sensor in FPS? There are no hull damage, because there are no hulls to bump into walls. Players are not aircraft, and i'm not sure why it is present in an aircraft sim. Can't the pilot avoid the collision himself? Oh, and there is no attached picture. Idea 2 can work well (or not well?) with racer. By the way, he said that they may work best with vehicles. I think all his examples featured players on foot. Of course "they may work best with vehicles", he took these features from vehicle sim. Duh. I didn't click update to actually include the picture, probably. Fixed. I agree with the racer comment. On the Harmata's comment, aircraft need RADAR because the human eye can not see and the brain cannot discern objects at distances that a deadly missile can. This gives the pilot More or Enough Time To React which is the point of the Threat Detector. About the tactile sensor, there have been plenty of times when I'll be strafing an enemy and can or should not look away and may bump into a wall at just the wrong moment. Sure, it's possible to avoid this if you know the map extremely well but you might just misjudge and sure humans have all these sense but in an FPS there are only 2 senses -> sight and sound. Tactile sense needed in an FPS *more* than a third person perspective because you cannot see around you to compensate. I'm aware it is possible to just turn and look but wouldn't it be better, if implemented, to just know and continue firing at the enemy? It is possible to snipe with the rocket launcher on a large map for example and that is why I mentioned large maps. The features would not have to be on by default and could be, if desired, added to on-foot mode as well. Call of Duty? I didn't get it from that and who cares if it is similar to anything else? If it works it does and vice versa. If anything you should, or would have if you saw the pic first, have thought Halo first since the color scheme I chose for the example image is inspired by the motion tracking system in Halo. "I think all his examples featured players on foot. Of course "they may work best with vehicles", he took these features from vehicle sim. Duh." I may have, and sure almost 100% of the game is on foot. Guess what though... what kind of infantry soldier can bunny hop by default? Sure, this has not been explained but if I were to guess it would be that the player (on-foot this time as player can also be in vehicle), is wearing some kind of fancy high tech suit. Also, some vehicles (the spider walker - maybe it's only in a certain map, i don't know) can also "walk". The suit itself might as well be an aircraft. Edit: It is when the jetpack mutator is on... Edit2: You can play Xonotic in thirdperson, but I do not. I hope I covered the comments. Uhmmm, no, i'm pretty sure you don't have to keep the whole map layout in your head all the time to not bump into walls that are near you. Like, close enough to bump into. Also, third-person view does not provide large view of the player's surrounding and camera gets closer to player when he is near the wall. No, because you don't need to turn around to see walls behind you. I don't know about you and other aircraft sims fans, but i usually see where i am going, which means that even if i will turn around later i will still know what's behind me, because i was going in that direction a second ago. Besides, even if i'll bump my back into a wall, i'm still pressing a strafe button, which means that i will move to the side. My hull will not explode and i will not lose my cargo of female Twi'Lek slaves that i was transporting to Tatooine. If you are flying it doesn't mean that you are inside a plane. Let's analyze your picture. There's this dial in the lover part of the screen slightly above the floor that points at a flying rocket miles away from the player but right in front of him emitting bright light and awesome sound in a place where this rocket can approach him only from two directions from small distance. At the same time this dial also tells the player that there is a wall behind him, even tho right side of this wall is already visible, and will become, well, even more visible when the player will move the mouse to aim at the enemy. Also, the dial is below the actual action, and the player will see only floor when he'll look at the radar to see a little red arrow that will show him the direction of SOME projectile approaching. Or not even approaching him, just flying by. A projectile which most certainly emits very bright light and very loud sound. If you can't spot THIS, even a large hadron collider will not help you. I was still, and did several times after posting, tweaking these ideas to make more sense and be more useful to the player. In that way, this is somewhat a brainstorm as well as feature suggestion. I wasn't saying you had to keep it in your head. If you've played an map often enough, you know your surroundings but not always preciesly how far away objects are. Sure, most Xonotic maps now are open or mostly free from clutter on the ground however there is always the possibilty of running in to other things such as ramp sides, railings, boxes, pillars, other players and with these and other possible *unexpected* obstructions have caused a momentary stop and not always "I'm still strafing". 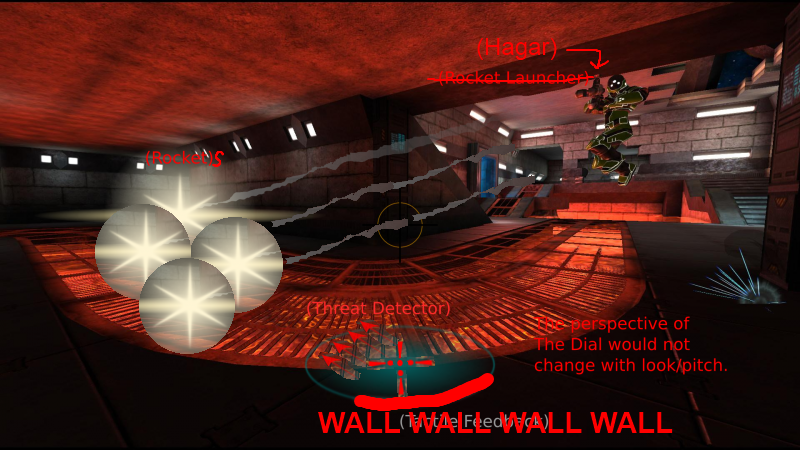 (03-21-2013, 10:44 PM)Harmata Wrote: Also, third-person view does not provide large view of the player's surrounding and camera gets closer to player when he is near the wall. You are correct sir, come to think of it in Xonotic and other TPS (report, hah) this happens. So, when you back into a wall the camera tells you by moving closer to player's character. Okay, that goes along with what I was saying that the third person view helps with near-player obstacle avoidance. Naturally, the sides are visible to the player in third person. If by "I usually see where I am going" you mean "know where I can go" then sure 90+% of the time. This isn't about that, I didn't start shooter games yesterday and whatever you do in a galaxy far far away, like Vegas, stays in a galaxy far far away. Also, there is no tactile sense in a plane, helicopter or tank. I don't know what your obsession is about hull damage as I never mentioned it. Uh, so the *only aircraft*, I said aircraft and not plane, in existence that you know of is a fixed-wing airplane? A personal aircraft like a jetpack ... well I said it. It's an aircraft. I have no idea what bunny hopping is classified as, though. Hopping insane. (03-21-2013, 10:44 PM)Harmata Wrote: Let's analyze your picture. There's this dial in the lover part of the screen slightly above the floor that points at a flying rocket miles away from the player but right in front of him emitting bright light and awesome sound in a place where this rocket can approach him only from two directions from small distance. At the same time this dial also tells the player that there is a wall behind him, even tho right side of this wall is already visible, and will become, well, even more visible when the player will move the mouse to aim at the enemy. The lover portion? You so Fuh-neh. I wouldn't want the tactile sense anywhere other than the center of the screen. Why did you have to make this dirty, Harmata? . Collision is not always about major walls. The image is a front page photo with, yes, simple modification as I was too lazy to find or make a screenshot of an actual rocket in a scene. The point of the image was to show the layout of what I envisioned the dial to generally look like. I agree with your point about the wall becoming larger when backing up to it but there are various other potential obstacles as well that are not as large as an entire wall. The point of TS is to be a one-function-covers-all reasons one might be suddenly stopped by an obstacle in any direction. It would be additional feedback, like force feedback/vibration, or instant confirmation that there is in fact something stopping the player. It's a general purpose optional function. The SOME projectile approaching the player issue doesn't bother me so much as it briefly indicates the direction of enemy players that may be out of FOV. A bouncing grenade that Rockets for sure would be covered and the rest I am not so sure. Remember, only objects *still* moving towards to the player within a specific angle to the player would show up and the larger the angle to the player the less opaque that particular arrow would be. There could be a setting to narrow or widen the acceptable range of angle from projectile vector to player's location. Projectiles that miss would not stay visible for long. The strategy on how to use it would be up to the player. Turning to face an attacker to actually avoid projectiles it advised. Also, I'ld add that maybe distance shouldn't play in opacity of threat arrow but line of sight visibility to the projectile from player would and that would all be client side I would hope. I wouldn't always look at the dial if I saw a threat indicated though I would notice it in peripheral vision. If a player shot a rocket down a long corridor from behind you and you are fighting someone else, either on foot or in a vehicle, wouldn't it great if a bit of a ways before hearing the rocket's jet you would be alerted to it? If you want to be surprised, fine then disable/don't enable threat detector. The thing about the Xonotic rocket launcher, that I absolutely love, is all of the functions and how they work together. Hold primary to guide as with a laser and tap secondary to detonate. This sounds more like the combination of, if speaking in terms of air combat, an anti-aircraft weapon. That is why I made the connection in the first place. If someone can, with or without zoom, snipe you (as I love to do at times) with a rocket - tracking you and just waiting for you to be close enough to detonate, wouldn't it be awesome if the player in question could go: "Sh*t!" and then go into an avoidance dance? Yes, they already do but in this case there would be more time to toy with the prey. "Players are not aircraft, and i'm not sure why it is present in an aircraft sim. Can't the pilot avoid the collision himself?" It isn't in or from a flight sim. The tactile sensor idea is something I thought up during some random FPS game. Probably, Call of Duty: MW#, actually, where getting stuck on a wall or the smallest wall/pile of junk, could get the player killed for sure. Tactile Sense could work anywhere though and of course does not have to be enabled if not desired. If I missed something I'll be annoyed after all that. Knowing your surroundings implies knowing how far things are. Duh. They always were like that, just like all maps from Quake or Unreal series. Not one game had an obstacle detector. I was talking about a hull. There's a difference between flying and flying inside an aircraft. Quote: If a player shot a rocket down a long corridor from behind you and you are fighting someone else, either on foot or in a vehicle, wouldn't it great if a bit of a ways before hearing the rocket's jet you would be alerted to it? I'm already alerted by the firing sound. Since i'm in a corridor, obviously i will know the direction of the shooter. Quote: Probably, Call of Duty: MW#, actually, where getting stuck on a wall or the smallest wall/pile of junk, could get the player killed for sure. And there you have it people, the source of all evil is again, for God knows how many times already, Call of Duty. Generally, yes. If in every situation in Xonotic there were few environmental obstructions (things besides walls) *and* no other players to potentially bump into then sure there would not be enough reason to implement something like tactile sense. Having such a function, in whatever form, would make Xonotic even more unique, probably, as no one else has a tactile sense indicator. Usefulness, of course is up to whomever if any would take it upon themselves to implement or not. Addition: For infantry mode and in addition to some kind of added physics for player impacts (especially in the air at high speed) maybe the impact could cause some kind of indication like a non-perspective-changing screen shake or similar as if actually hitting something in the air. That is so there would be little aim throwing as opposed to the small amount caused with the screen wobbling function. I've played all of those and had no problem with them either. You are correct as it is a new idea/feature that is both optional-to-enable and not required but would/could be interesting and is definitely feasible if there is already a platform available to harbor it, such as that dial thing I mentioned made purposeful probable by one or more other functions as well, and by programming it in as simple a way as possible. Example: letting it be a resistance and direction meter. That is less useful though since there are only eight possible directions without analog movement. Sure, but since the player isn't flying on their own the suit+jetpack is the aircraft and the hull of it is the suit. Me too, however there are more situations than that to account for. Image a 2 or more player pincer attack. No matter what plan the infantry-mode player has to escape this situation, and it would be a bit difficult with fast projectile weapons like machine gun/nex/etc, in say a rockets only match or in one where most players have grenade weapons (if indicated by TD) then having more than the sound to rely on to figure out the direction of attacks coming at you from multiple directions could come in handy in a mode where Threat Detector is allowed (if a mutator). Would having such a strategy break the rules of Xonotic? Does nex sniping do this to? Why not allow this in Xonotic even as an option/mutator? I am interested in your opinion as you seem to care, like I do, about the feel of the game and not breaking it's vibe. If it is a simple environment with little clutter and no other persons to bump into at the very moment that would cause projectiles to hit their target (even fast ones like bullets if someone is spraying horizontally to track) then sure there is not enough reason to implement it. So, flight sims and the Halo franchise had nothing to do with this? It's wrong, like it is evil, in your opinion. I'ld have to disagree with Call of Duty having any major role in my application of the tactile sense indicator idea in Xonotic. I've noticed the disparity between real life sense and virtual senses over the course of experiencing many different FPS games. The trying-to-be-realistic COD game simply made it obvious. it could be cool, if implemented right, to have available as an option in my opinion. Even more so in ground vehicles. Xonotic is a great game and by no means ought the default behavior be changed in implementing any of these suggestions. The mirage/hologram/hallucination idea is another story. if you saw three dangers in different directions, it's time to do a laser jump or something to avoid and start taking care of business and hopefully there would be enough head room to float while the player gets prepared for that meeting. Oh, yeah. Sound used with the threat detector would probably be annoying and counter productive. So, scratch that or keep as an additional sub option for it's configuration with custom sound effect. The dial, being a composite indication device, could also be optionally used for other client side things such as an analog game timer, compass or any other thing that is polar in nature. Size, opacity and where it is could be customized just like other in-game UI elements (if not already since I haven't messed with that feature too much). There's still a difference. Compare the Iron Man suit with The Nostromo (from Alien). They have different mobility, speed, size, durability, controllability. They will perform differently in same conditions, and require different handling and sensor systems. Quote: Why not allow this in Xonotic even as an option/mutator? The question is not in permissions, the question is "Is it wise to spend a lot of time and effort on an optional feature that doesn't change anything?". Dude, read your posts again and look how many things must be implemented and calculated just to tell a player that there's a projectile incoming or that there's SOME obstacle around him on an additional radar. Look how many times you've used words like speed, angle, transparency, view, direction. And all this just to provide information that is already easily obtainable. Because it's in the gameplay. I will still repeat that "a radar, an "incoming missile/plasma bolt" indicator and flares can work with vehicles". You know what, i just remembered that in Quake Wars: Enemy Territory you could often see the incoming projectile when you were flying, without any arrows pointing to it. Hell, even the sound beep weren't needed, because the projectile had its own clearly audible sound. However, the sound beep makes the vehicle itself more realistic and believable. Like, what futuristic military vehicle doesn't have sensors? MkThUnderwd, you should gather all your ideas and notes that were made in you later posts and update the OP, or at least highlight them with green color, because no one will search for them in dozen of posts. You can also update the thread's name. Maybe someone will become interested in implementing these things. ...just to bring you two to some other ideas - can anyone make a sample screenshot showing the disc radar when someone is shooting at you with hagar? Thank you, that was what I imagined. Harmata, true that and funny pic. I'll eventually consolidate all the changes into the first post and such. My original image didn't follow what I described in text, whenever I added them, because I was too lazy to make something like the attached image. The rockets in the original image, and Harmata's version, would not show up on the threat detector because of their 45 degree or more trajectory miss. That diagram/demo image should give a complete representation of what I was describing in showing the direction of projectiles aimed right for you being most opaque and so on. If multiple shots are coming from a similar trajectory then the indicator arrows would mostly overlap as they are normal in direction to the player and dial's center. If both players are still and your attacker shoots you with the Hagar (and you don't get blasted away yet) you would barely be able to tell there is more than one arrow pointing to all those projectiles if you stared at it. To reply more fully, there is actually a permission issue with mainline project inclusion since there is potentially a limited amount of space for mutators and options and also for settings interface cleanliness. Also, if some change gets too away from the mantra "Xonotic is a free, open source (GPL) ultra-fast, first-person shooter" then it's likely not to be permitted as a change. Just sayin'. Well, there you have it. Even more reasons not to waste time on the wall detector. No wall detector is being proposed although, if in proximity of a wall, the Tactile Sense Indicator, or whatever it would be called, would show that it was there. Any close enough object would get shown with direction. Any game info that can be shown in a polar format that is then displayed on the [sun] dial could be consolidated under it's own sub-menu. Easy.